On Saturday, May 7th, Grass Valley Taiko will help the Kodo Arts Warehouse celebrate its 10th Anniversary in Nevada City with a parking lot performance at 2 pm. We last performed there in 2011 in support of relief efforts for the victims of Japan’s 9.0 magnitude earthquake and subsequent tsunami. Jake and Yuko are wonderful hosts and we are excited to be there again! 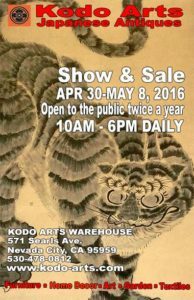 Come help us celebrate and while you’re there, check out the great collection of Japanese Antiques on sale! Next Next post: GVT on Front Page of The Union!